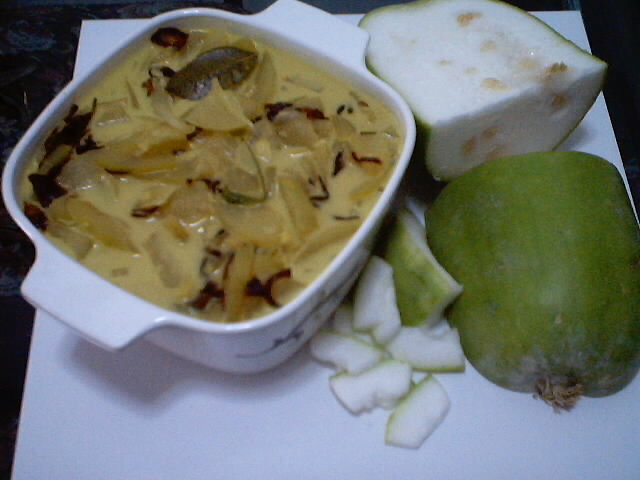 Kuwalo Bafad (Ash Gourd Bafad) | My Cooking Diaries "CooklikeCecilia.com"
This is a favorite dish at home, enjoyed by my husband, children and me. It’s a vegetable stew, very light and goes well with rice or any type of bread or the typical mangalorean panpole, sannas, appams. In fact it is delicious with appams! This dish doesn’t call for any oil during cooking other than the fat in the coconut milk. The garnish uses some oil for frying and for the calorie conscious, the garnish can be avoided. I make this on a weekly basis, without the garnish, which I use only on special or festive occasions. I have started using 1 tsp cumin powder and 1/2 tsp. garam masala powder, which you may add alongiwth the other spices, if you wish. Cut the pumpkin into ½” or 1” thick long wedges. Peel the skin, cut out the portion with the seeds and cut the wedges into thin slices. Slice the onions, slit the green chillies, cut the ginger and garlic into strips. Add to the pumpkin along with the thin coconut milk, salt , turmeric, bay leaves, cloves, pepper corns, cinnamon, coriander and pepper powder and the jaggery. Mix well and cook till the vegetables are tender. Then add the thick coconut milk, stir and simmer for 2 minutes. Top with the fried onion (and the oil) for garnish.